Tricky Challenge 2 Level 1-60 Answers, Walkthrough, Solutions, Cheats for iPhone, iPad, Android, Kindle, iPod Touch and other devices with screenshots for you to solve the level easier. This game is developed by Ronghui Liu. Tricky Test 2 Genius Brain! One of the most popular brain teasing game in the Apple App Store and Google Play Store! Each challenge is unique and you have to think out of the ordinary to get through the challenges. Tricky Challenge 2 Level 1 Answers, Walkthrough, Solutions, Cheats for iPhone, iPad, Android, Kindle, iPod Touch and other devices with screenshots for you to solve the level easier. This game is developed by Ronghui Liu. Use a finger to cover the empty hole. 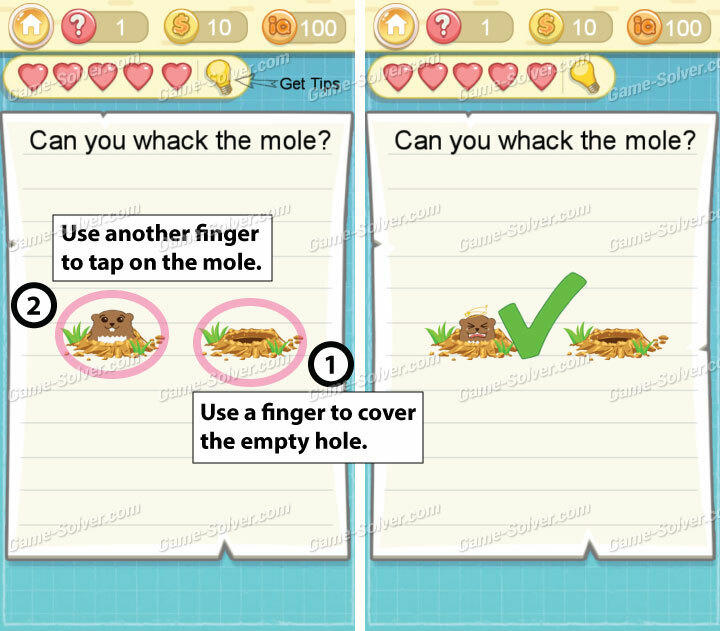 Then use another finger to tap on the mole.